Degenerative spondylolisthesis is the most common form of developed vertebral slippage. It is primarily caused by aging of the spinal joints and ligaments, although many cases also have congenital components that tend to dispose particular people towards its development. Most typical cases of spinal degeneration-enacted listhesis are asymptomatic, self-limiting in progression and non-pathological. However, some cases can become problematic when they progress to serious classifications of grade 3 or 4. 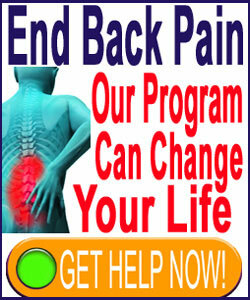 Spinal deterioration is universally experienced by adults and is in full effect by the age of 40 or so in most people. The processes begin in the areas of substantial spinal activity, including the lower lumbar and mid to lower cervical regions. Not coincidentally, these are the same locations most often affected by spondylolisthesis. This report provides a full overview of degenerative varieties of listhesis in the lower back and neck. We will detail the causes and mechanisms of action for listhesis to occur in association with spinal deterioration, as well as the consequences to patients’ general health and physical functionality. The degeneration processes affect virtually all components of the spinal anatomy, including the vertebrae, intervertebral discs, spinal ligaments, central and foraminal canals, facet joints and even the supportive musculature. Many of the aspects of structural deterioration can incite spondylolisthesis and act as contributors to the formation of vertebral migration, especially in the neck and lower back regions. As spinal components degenerate, they are changed in ideal form and functionality and often suffer the degradation of protective mechanisms that help to keep the joints stable and fully functional. While most degeneration causes obvious structural changes, these various processes are still usually quite benign; although some can be problematic and when combined together, the overall effect can become truly pathological in rare instances. Minor listhesis enacted by spinal degeneration is usually nothing to worry about, but some cases can become clinically severe and may even demonstrate pathological components that can cause pain, neurological consequences and possibly, spinal instability. Facet joint degeneration, ligamentous laxity and disc irregularities are all relatively commonly seen in older patients past middle age. These three consequences of age and activity can encourage low grade listhesis, since the bones may not be held firmly as these tissues degenerate. The results include a slightly extended range of vertebral motion and a tendency for the bone to slip forward slightly, usually qualifying as grade 1 spondylolisthesis. If the patient has a history of injury to the pars interarticularis or demonstrates a congenital abnormality wherein the pars is elongated, thinner than usual or improperly formed, this time in life might cause spondylolysis to occur. 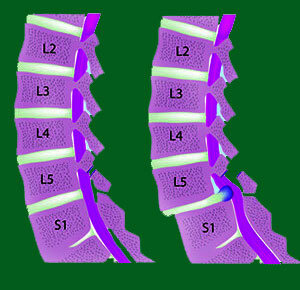 This occurrence of a fracture of lamina at the pars location allows the affected bone to slip much further than if it remained tethered correctly to the vertebrae below and above. If the remainder of the spinal anatomy is relatively sound, the result will be grade 2 to low grade 3 listhesis in most instances. However, some cases will be held to grade 1 progressions, while others will advance to upper grade 3 or grade 4 in less typical scenarios. Atypical listhesis occurs when the affected vertebral bone is so dramatically influenced by the degenerative processes that very significant listhesis results. These upper grade 3 and grade 4 conditions usually require professional medical intervention, since they are often symptomatic and might even pose a risk to overall spinal stability and functionality. Most people who fit this category of listhesis will demonstrate abnormal levels of facet joint, ligamentous and disc-related deterioration, in combination with congenital abnormalities of the pars interarticularis and/or the facet joints. Some patients might demonstrate spinal bifida in less severe profiles or a past history of acute or RSI trauma to the affected vertebral region. Some of the worst cases of developed degenerative-influenced listhesis may include all of these factors working in unison to facilitate substantial vertebral slippage. It should be noted that degenerative listhesis can often be cross-indexed as also being congenitally-motivated or influenced, since many patients display spinal structural abnormalities from birth that dispose them towards developing listhesis, or worse degrees of listhesis, but it is the spinal degeneration that sets the actual process in motion and creates the vertebral slippage. Some cases can also be classified as injurious listhesis when trauma works along with degeneration to create the abnormal vertebral movement.